Well, I can say that October was a crazy month for me. I unexpectedly became a national "technical expert" on the Healthcare.gov web site after writing a blog post about my experiences on the first day the web site launched: Healthcare.gov is a Technological Disaster. The article went viral about a week later and I've appeared on national newspaper, TV, and radio shows. More details are below. For those of you who've Liked our Facebook page or followed our blog, you've experienced how this media frenzy grew overnight. Why is President Obama talking about web site design? How many levels below him should that have been taken care of? In fact, it's fascinating how much computer technology is impacting this administration beyond Healthcare.gov: WikiLeaks, Snowden (how can system administrators with low security clearance manage accounts of higher security people? ), the NSA monitoring of all electronic traffic from friends and foes, etc. Our industry is impacting national security, diplomacy, and ethics. And it's being managed by people who were never trained on technology. I've found people to be very receptive to my non-partisan, technical information. From meeting the House Energy and Commerce staffers in charge of managing the ACA project to reporters and politicians of all sides, it is absolutely stunning how little they know about what it takes to build a web site, software development, or databases. It's no wonder they can't tell if something should cost $1 million or $300 million, and how their decisions impact that. Hopefully, I can continue providing technical information without being dragged into the politics. The least they can do is spin the right facts! Total Access Analyzer helps me find errors I could never discover with other tools. It thoroughly examines the structure of my databases and every property and setting of every object in the database including the code. It shows me the errors and provides Suggestions for best practices and Performance Tips. It also reveals any issues with code and documents how my code works, and can produce diagrams. It even helps find Embedded Macros and TempVars! It is easy to see why the Total Access Analyzer has been the Winner of every Best Access Add-In Award since 1994. The Total Access Detective is also very useful and has helped me to document all the differences between two Access databases or between two Access objects. It works quite quickly when comparing two objects. I produce several editions of some databases and it is important that they all work the same. The Total Access Detective checks every property and setting, including code, and shows you every difference. It has helped me to produce much higher quality Access databases. Thanks Patrick for your endorsement! We love meeting and exceeding the expectations of veteran MS Access developers like yourself to make you more productive than ever! On November 21, 2013, J Street Technology is sponsoring a day of Microsoft Access application development called Access Day in Bellevue, Washington. The first of its kind, several presenters including fellow Microsoft MVPs Armen Stein, George Hepworth, Tom van Stiphout, Andrew Couch, and Kevin Bell of Microsoft. Luke will present on upsizing Microsoft Access databases to SQL Server and SQL Azure on the Microsoft cloud. Visit the link for more details. Space is very limited. This is the first time J Street is organizing this event, so even if you can't make it, please let them know if you are interested in a future event. Hope to see you there! 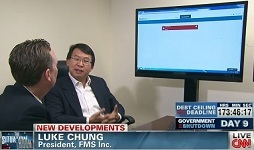 FMS President Luke Chung has unexpectedly become a national technical "expert" on the problems plaguing the Healthcare.gov web site for the Affordable Care Act (Obamacare). By documenting the problems from his experience trying to use the site on the first day, he was the first to warn there were serious technical problems beyond too many users. His blog posts went viral. Chris Jansing Show: "It's just an awful web site"
For descriptions and links of all the coverage, visit: Media Coverage for Changing the National Discourse on Healthcare.gov. Be sure to Like our Facebook page to keep up with the latest media activities. "Bought and configured Total Access Emailer for a client to send out numerous Alert reports to various people in the organization. Works like a champ (which is what I've come to expect from FMS), makes my client contact look like a genius and is helping the organization go through a complete culture change as a result of timely analytical reports. You guys ROCK!!! Thanks for all you do to help us in the field." Thanks George! We love delighting our customers and making you look great to your clients! Visit this page for more customer testimonials on Total Access Emailer. Microsoft released Service Pack 2 (SP2) for Office 2010. We've written a paper describing how you can get the free download and the list of enhancements. For Microsoft Access, this includes updates to the program and the Runtime version. Other products include Excel, Groove, Outlook, PowerPoint, Project, SharePoint, Visio and Word. There are also some known issues with Office 2010 SP2 and SharePoint 2010 and 2013. Read our paper Microsoft Access and Office 2010 Service Pack 2 (SP2) Enhancements and Issues for details. Separately, Microsoft related a security update in September that has caused some installations to fall into a loop to repeatedly install itself. A new update was released to address this. For more information, visit: September 2013 Office Update: Targeting and Repeated Offering. FMS welcomes the University of New Mexico to our growing list of educational institutions using the services of our Professional Solutions Group to create custom database solutions. The FMS Professional Solutions Group is assisting with the development of a database application with Visual Studio LightSwitch and SQL Server. Visit our Comparison Matrix to learn more about how Visual Studio LightSwitch compares to Microsoft Access and Visual Studio.